What is the best irrigation controller? It is important that the device is automatic and has various settings. Another crucial factor to consider is the place where the unit will be installed. Indoor options are plugged into an outlet while outdoor models are weather-resistant and have more beneficial features. Then, consider the models with several programs so that your lawn and flowerbeds are watered in different ways. We believe that Rachio Smart Sprinkler Controller meets all these criteria best. Why have we chosen this model? It is a best-selling and high-rated model that works with Alexa. The device also uses weather data to adjust the irrigation process. You can set up 8 customized zones while a remote control will make the whole process easier and convenient. Mobile apps will allow you to operate sprinklers without leaving the house. Daily lawn sprinkling is the key to an exemplary lawn. If you are too lazy to hold the hose, a sprinkler controller will save your lawn as some of them can be controlled even while you’re commuting to work! 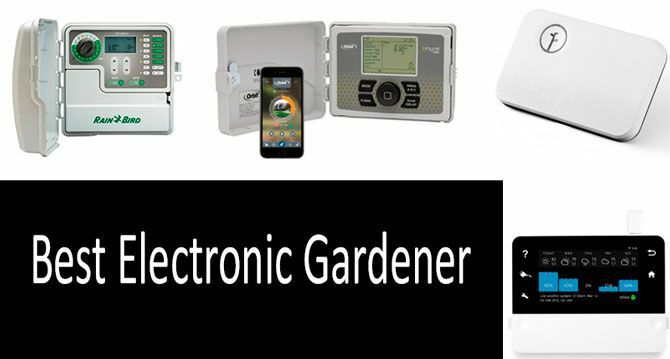 Today, we’ll look at how these devices work and will choose the best controllers in two categories: conventional sprinkler controllers, which are classic devices for controlling irrigation and Wi-Fi sprinkler controllers, which are modified and allow you to flexibly configure your sprinkler from any location with a smart phone. The items match any budget as their price ranges from $65 to $279. Let’s first find out what a sprinkler controller is, how it works and what features are most important for them. What is a sprinkler controller? What irrigation controller should you use? It’s an opportunity to acquire a beautiful lawn that will never turn yellow or drown in puddles of mud.. Once you’ve connected a small box to the irrigation system, you will get a real robot gardener which takes care of the lawn and watering regimes. Your job is only to configure it properly! Drying no longer threatens your lawn. Once you’ve invested in an expensive lawn, you can quickly ruin it by not watering it or merely forgetting to water it. It saves your water bill. Overwatering does not simply involve a local lawn flood, but can also lead to having some high costs in the water bill. Controllers will minimize your costs. You can schedule watering for the best time. Any professional gardener will attest that it’s best to water the lawn early in the morning. However, few are able to wake up at 5-6 a.m., especially during the weekend. Hot areas require lawns to be watered several times a day, and you’ll hardly be able to leave your job for that. An irrigation controller permits scheduling the watering down to a minute for many days in advance, taking into consideration weather and soil conditions. You can control it remotely. With a Wi-Fi sprinkler controller, you’ll be able to control the device even while you’re on a vacation thousands of miles away from home and customize its functionality. Any controller is supplied with at least two watering modes: a basic daily one and a customizable one. The latter allows for advanced configuration of not only the timing but also of different yard area irrigation. For example, the base model is designed for 9 zones. This is especially important for owners of flower beds as often different plants require different watering patterns. You only set it once! This is the rule by which most sprinkler controllers owners live. In case of a regular lawn, 2-3 programs (namely, a standard one, a drought one and a rainy season one) will suffice. The irrigation is scheduled down to the minute many weeks ahead, so you’ll be able to configure a 100% correct type of irrigation for any kind of weather. Make sure you always test your settings and their functionality for a few minutes! Weather sync allows adjusting irrigation in accordance with the changing weather. All modern Wi-Fi sprinklers are equipped with such an option. On the other hand, some more obsolete products aren’t, and their set mode of performance will not adjust to the weather conditions. Surprisingly, the automated irrigation systems (especially the top ones) are excellent in terms of being a useful gadget. Their ratings never fall below 4.5 stars, and the feedback is consistently positive. What is the reason for that? Well, some of the causes are easy operation, low prices, and high use for lazy and cost-savvy customers. Let’s move on to our rating where you’ll be able to choose a sprinkler to buy for your lawn to the envy of your neighbors! First, let’s focus on the regular classic sprinklers controllers that your parents used. They worked indoors or outdoors, and with their help, you could customize the watering. But they are not equipped with the remote access option, so all the setup is done through the main panel. We have selected 2 items with 9 and 12 irrigation zones respectively for you. 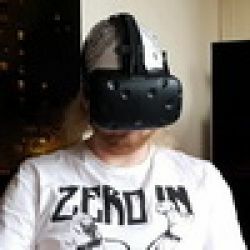 However, if you want to live the “I, Robot" movie and have a real "smart home" at your disposal, scroll down to the Wi-Fi sprinkler controllers review. This is a classic inexpensive 9-zone option with a high 4.7 stars out of 5 rating. The competitive edge of this model is its convenient and intuitive interface. Yes, it lacks portable gadget sync, but for this price, it is a certain must-have for any one owning a lawn! Irrigation can be configured in 9 zones with up to 4 cycles daily which is more than enough, even in arid areas. How does it work? Suppose your backyard lawn requires less watering because of the shade or plant peculiarities while the roadside lawn should be watered three times a day. This is not a problem! In zones A and B, the sprinkler will switch on every day at sunrise and in zone C, it will run three times a day: early in the morning, at noon and at sunset. As a result, you’ll have a green lawn, without having to spend even a minute actually irrigating. The case is quite robust as it can be installed both indoors and outdoors. Dirt and moisture won’t harm it unless you forget to firmly shut the rear door. Rain Bird SST900IN: Check the current price. If 9 irrigation zones are not enough for you, check out the next item! This is a 12-zone controller with a high 4.5 out of 5 stars. We should note that the previous model’s 9 zones are often insufficient for large gardens and lawns, so it is reasonable to buy a device on the basis of "zoning" the area to be irrigated. That means you’ll have one controller for the backyard, another one for the lawn and a third one for the alleys. If 9 zones are too few and 18 are too many, check out the halfway option with 12 zones. The irrigation performance is identical to the previous model as you program 4 one-time watering for 7 days with the most flexible combination of these options when setting up. The only problem is that you will have to spend more time on the setup due to the increase in the number of zones. But we believe that’s not a real issue. To sum up, it is a must have for large lawn owners. We’ll start our review with a $195 universal bestseller before moving on the smartest and fanciest one which costs $279 and will take care of your lawn, keeping track of the slightest weather and temperature changes better than a human gardener. And in the end, we will present you with the most cut-rate option in this category for $94. We’ll start with the #1 Best Seller in the Automatic Irrigation Controllers category. It’s way ahead of other controllers in the same category (1900 units) due to its truly modern design. Here we have a modern white case which is not overloaded with unnecessary buttons. The entire control is done from a smart phone or another portable gadget. Note the «2nd generation» phrase in the name of the gadget, which means this product is the successor of the first controller of the company, similar to it in terms of functionality but much larger. Transfer of control to mobile gadgets makes everything even more intuitive. Previously, there were 8 zones on the control panel, and you had to remember or write down where each area was actually located on a piece of paper. Now, you have to simply rename Zone 1 as “The Grass Yard,” and you will never get confused while setting up the irrigation. You may read nearly 1000 customers’ reviewsabout making the control even easier. Weather response is yet another attractive aspect. If it starts raining, the system will automatically turn off the sprinklers. Also, the settings allow controlling the switching period after a certain time after the rain or if the temperature changes. You won’t have to dig into the settings as long as the system is synchronized with the weather services and will autonomously adjust the mode. Make sure you have a stable internet connection and do not forget to pay the service provider in advance if you are away from home for a long time so that the control system is connected to the network too. The Rachio controllers line is available in two options: an 8 zoneand a 16 zone. The prices are well superior to the prices of the controllers without Wi-Fi, but the performance is definitely worth it. «Rachio connects to meteorological stations in your area and predicts whether there will be rain». 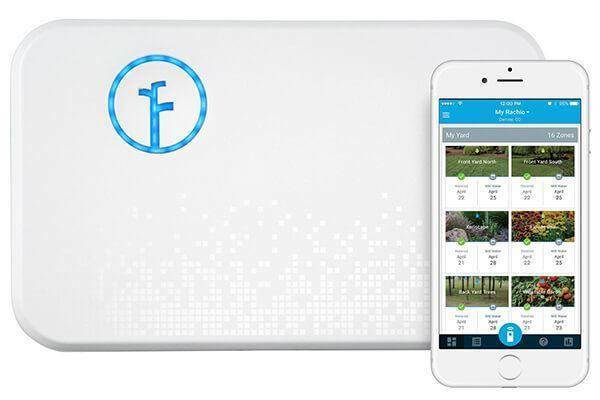 «With Rachio, searching for malfunctions in the sprinkler system only takes several minutes. Switching zones happens from your phone while you go on zones». «Rachio connects with home automation platforms such as Control4, SmartThings, and Wink». «You receive notices if watering is missed because of approaching rain». «It is possible to add a photo to each zone, to specify duration of watering of each zone or repeat watering. The application on the phone will tell when the zone was last watered and when there is a following planned watering». This advanced RainMachine model lays special emphasis on the exact syncing with the weather and the automatic creation of irrigation modes with a focus on the weather forecast. This is the highest-tech model in our review as it is not only controlled with mobile devices, but also uses a touchpad instead of the usual knobs and sliders. That is why its price is justified. The panel displays all the relevant information, i.e. the humidity, the weather and irrigation need. The previous model is still inferior in terms of functionality due to lack of touch controls: after all, it simplifies the job when the owner is at home. You can configure irrigation even for a lifetime ahead: you can disable watering in winter, automate the hottest months, and voila, you’ll have a green lawn without too much effort. The number of zones available is satisfactory as the one model uses 12 zones while the anotherhas as many as 16 zones! Its rating is as high; it is 4.5 stars. The choice is definitely not a cheap one, but connoisseurs of high-precision smart equipment will go crazy about it. If you’re looking for something simpler and cheaper and still equipped with Wi-Fi, you are likely to be interested in the following option. This is the only cheap and functional Wi-Fi product available on the market. Its exterior is, of course, less sophisticated, as the screen is monochrome, and the whole design looks pretty harsh. But the durable case fits not only unpretentious watering settings (amount of water, frequency of irrigation, water-saving mode) for 6 or 12 zones, but also features smart synchronizing with the weather forecast. The water-saving mode will allow you to manually set the threshold for the water flow which is a great feature for those who like to save money. Orbit Sprinkler Controller can also be controlled from a smart phone or any other portable device. The idea is the same: you rename the zones, manually set the timer, and enjoy a green lawn. This is a reasonably-priced option, the "low cost" of which is visible only through the design. As for the functionality, it is vast enough and convenient, and the rating is similar to the top items, with 4.3 stars out of 5. You won’t get many controllers with remote access on the market for a cheaper price. «Excellent compatibility with Alexa. Definitely a combination, "Nothing to yourself, the Factor" from any around when I ask "Alexa, ask that b-Hyve has watered a lawn" and my run of sprayers. Convenient control from the phone. I can operate sprayers and change watering time». «The best feature of this controller is its integration with the weather forecast. It automatically plans a watering delay and provides excellent economy. If you want to cancel a watering delay, simply click ONE button, and watering will continue according to the schedule. For the last 3 weeks, my sprayers worked only TWICE because of rainy weather». 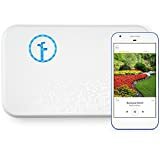 «This smart sprinkler has a Smart Watering feature that can set the watering schedule based on the number of heads, weather, soil type, etc. The Smart Watering program supports restricting the watering to certain days of the week and/or times of day». Keep your lawn green and stay up to date with modern technology by using irrigation controllers! If you need to control microclimate, bearing in mind the weather forecast along with irrigation, choose a weather gadget from our review of 9 best weather stations. Gita, Yes, Rain Bird SST900I includes 120v transformer. Tell me, does the Rain Bird SST900 come with a transformer? Anastasia1, I think if you do not have problems with the tension in the house, it's absolutely safe. Look at the ratings of these products. People are very happy with this modern gadget. It is fantastic! Only who uses these Irrigation controllers? How safe is it to use them when you are away from home?